Thanks to an ongoing shift in data policies, more and more satellite data is available for free and — more or less — easily accessible. Data from a diverse range of satellites can be downloaded, and in most cases used without restrictions. So why not have a look? A lot of media outlets are making ample use of those satellite images and data. 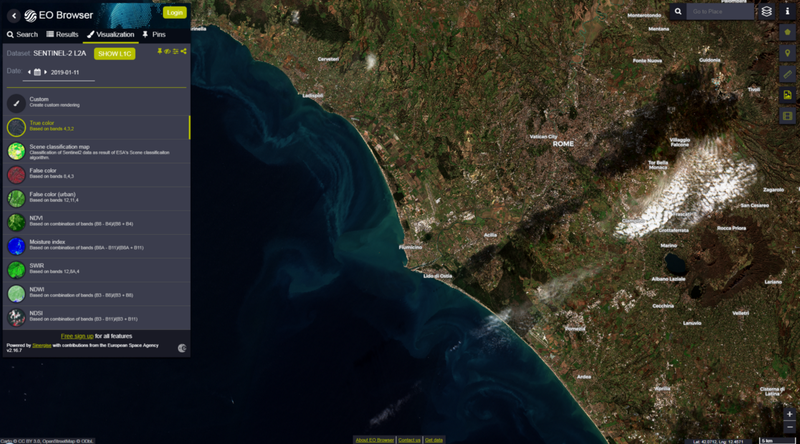 Not only open data policies but also services like the Sentinel Hub EO Browser are making it easy for even small newsrooms or single journalists to get the latest satellite data and use the images created from it. However, the people using satellite imagery from other sources or maybe even creating their own, aren’t always trained in doing so, which of course can lead to some mistakes. Those mistakes are usually not a problem for a private user doing some research, but for a journalist who is going to publish the images it is a problem, especially when the images are used as a source or proof of some aspects of their story. Let us take a look at the following image, taken by Landsat 8. 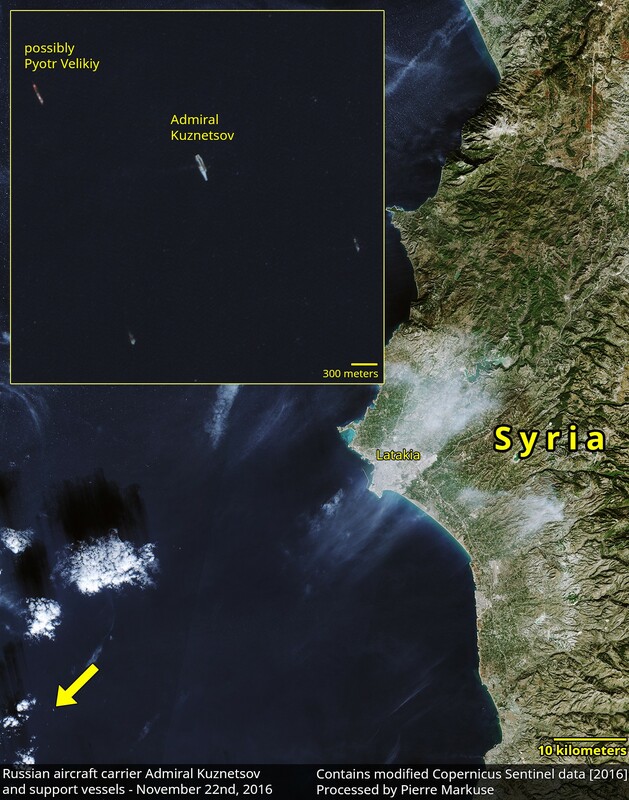 The image is showing the Russian aircraft carrier Admiral Kuznetsov (or “Admiral Flota Sovetskogo Soyuza Kuznetsov” to be complete) and some support vessels in the Mediterranean Sea. This is one of the cases in which not a mistake in the interpretation of a satellite image could lead to a mistake, but a lack of further information that could explain why we are seeing what we are seeing. It should also show you that, whatever you might be seeing in a satellite image, you should not immediately draw conclusions, as there are almost always more explanations for why you are seeing, what you are seeing. So what are we seeing? Well, if you take a look at the close-up in the upper right corner of the image you can see the Admiral Kuznetsov with a pretty large amount of what appears to be smoke coming from it. Actually, the smoke cloud produced is over a kilometer in length. I would assume pretty much every journalist would see it this way, and they would be right, it is indeed a big cloud of smoke. Without any further information, journalists could now draw a lot of conclusions. The vessel could be on fire. Maybe an accident? Maybe an exercise? Maybe even battle damage? The resulting satellite image would indeed look quite similar. However, in this case the reason is a pretty mundane one, the Admiral Kuznetsov has a rather out of date propulsion system and is still (at least at that time) burning Mazut, a low quality fuel oil that, in combination with the old technology used, is producing a lot of smoke. In the case of this aircraft carrier image, mistakes are most likely to be made because of a lack of context. However, while the initial interpretation of smoke is correct, a more advanced user of satellite imagery could have then taken at look at the infrared bands and would have seen there are no emissions that would support a fire. That would still be no confirmation that there was no battle damage but it should lead them to look for other explanations. The next example is an often-repeated one, and while it has no tragic consequences it still is a mistake that is conveyed to audiences again and again. 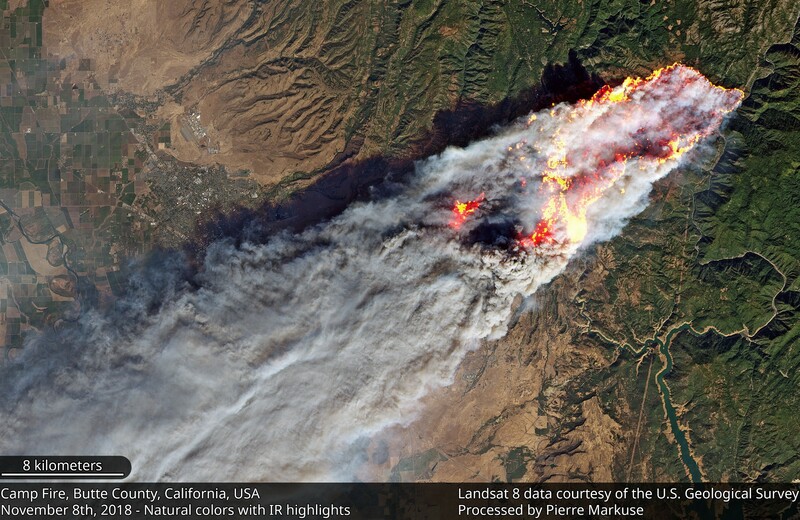 The above image of the Camp Fire in California looks as if it would be showing actual flames. However, what is looking like flames here are just zones that emit more infrared radiation, indicating heat. Those hot spots usually align quite well with active fires or zones with lots of residual heat, as you can see from the smoke emanating from those zones. Showing the IR radiation in that way is an artistic choice which can make images like those more interesting. In case you are wondering, the image without mixed in infrared radiation looks like this. It is important to communicate those things to the people the image is intended for. And for that at least some expertise is necessary in the newsrooms. I wrote about this in more detail on my personal blog in my post “Satellite Image Guide for Journalists and Media”. 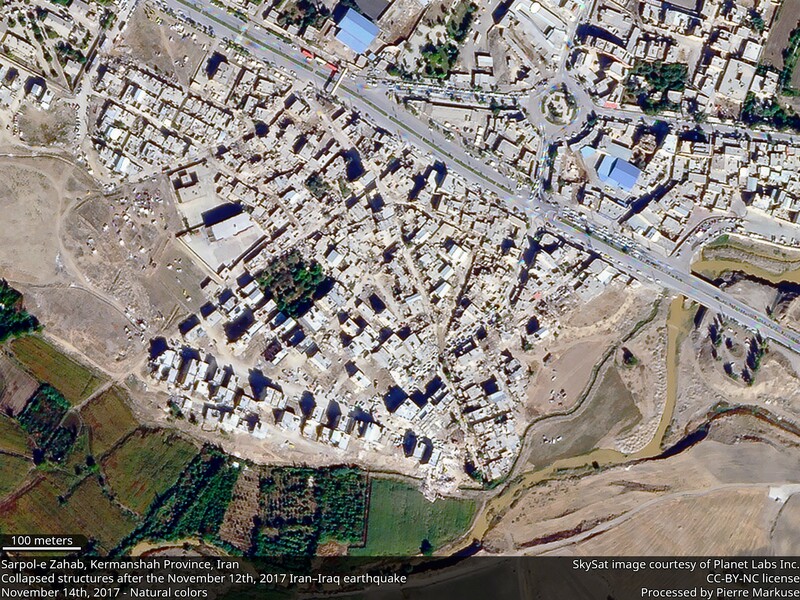 The post will also give you some tips to get you started with using satellite images. 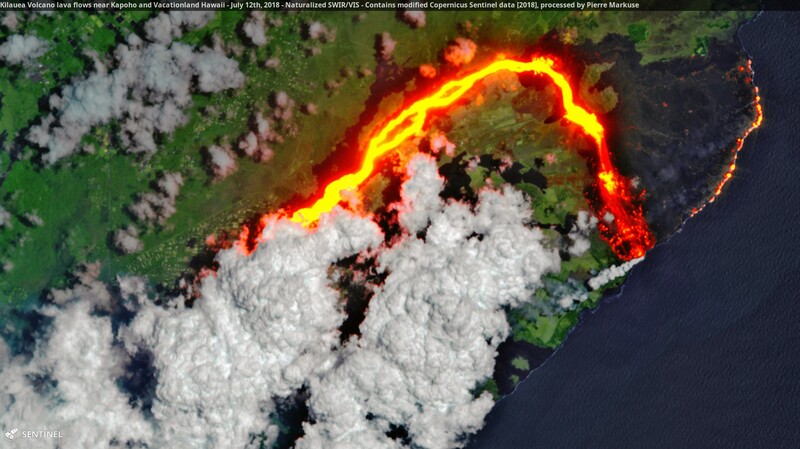 In this image you can the the lava flows of the Kilauea Volcano glowing red-orange. Well, actually, you can’t. While the lave flows were indeed glowing in some places, the glow was not really visible in natural-color images from space. This image again mixes visible light and infrared radiation, showing the latter in orange-red. It makes for a beautiful visualization but that again should be communicated. But it can get even more tricky than this. Just by talking to the person who created the images of above kind journalists could avoid mistakes. But now it gets really hard, take a look at this animation made from Sentinel-2 images. In these images we can see the Mayak Fissile Material Storage Facility (FMSF) in Russia. The Mayak site was the possible source of an increase in airborne radioactivity in Europe in the autumn of 2017. These images are showing that some work is done at the facility including at the end of September when the radioactivity was detected. It is, however, almost impossible to really say what is happening here, higher resolution images would be needed, and even with those it is not always possible to say what is going on. As you can see, just having access to satellite images doesn’t immediately answer all your questions. Sometimes it will be hard to see what is actually going on, and even if you can see it, there still might be more explanations for it than just one, and additional information will be needed to get the whole picture. Still, even when not showing the whole picture, imagery can be helpful to get a new angle on a story or explore possibilities. And while it is not always easy to interpret and use satellite images, it is certainly possible and can be a vast source of information for journalists. Not only can they make their stories more visual, no, they can use satellite imagery as source and proof for their stories. The above image from Planet Labs is a good example of a high resolution image, you can see damaged structures (especially in the lower half) as well as a camp made up of tents in the upper left corner. Images like these can help in making a story more visual or even be a crucial part of getting a story together. High resolution images are not always free of costs, but are in some cases needed to really get to the bottom of things from high above. Still, we can learn a lot from medium resolution images, take a look at the following image, taken by Sentinel-2. 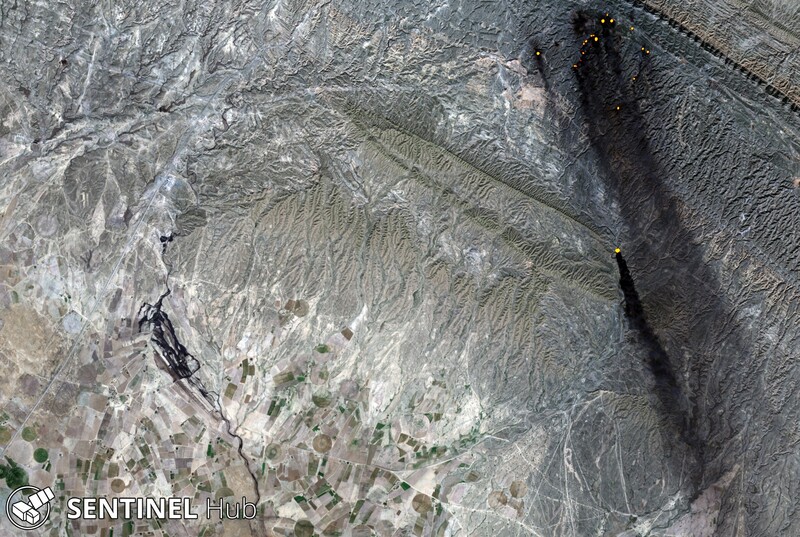 Oil Spill at Hamrin Mountain, Iraq, with burning oil wells visible in the upper right part of the image. January 12th, 2017. The above image is showing how Sentinel-2 imagery can be useful in environmental monitoring and journalism. Higher resolution is not really needed here, the image is showing what is going on. The burning oil wells were highlighted using a custom script in the EO Browser. 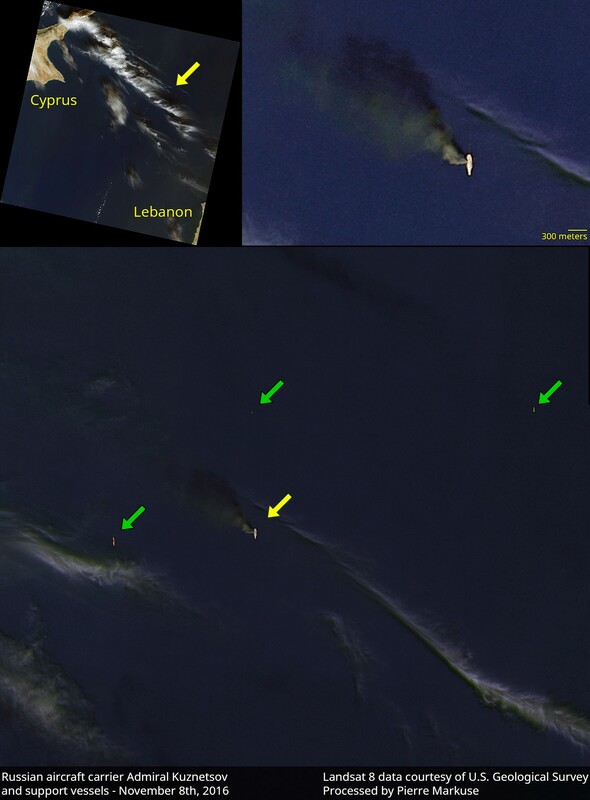 You should read “Environmental Monitoring of Conflicts using Sentinel-2 data” by Wim Zwijnenburg to get a few more examples of what can be done with satellite images when it comes to journalism. And don’t underestimate what the Sentinel-2 satellites can actually distinguish. Do you remember the Admiral Kuznetsov image from the beginning? It was taken by Landsat 8 with a 15-meter resolution. Now take a look at this image of the Admiral Kuznetsov, taken by Sentinel-2A with 10-meter resolution. Make sure to click the Flickr link and download it in full resolution. As you can see, 10-meter resolution is enough to identify the vessel. Assuming, and this scenario seems likely, that the usage of satellite images in newsrooms will just become more prevalent from here on out, media outlets have to make sure to have people who know what they are doing. This could be journalists who have acquired that expertise or dedicated remote sensing experts, the latter probably only be feasible in larger media outlets. Having said so much about journalism and satellite images I would like to again recommend the EO Browser and hope that journalists will give it a try. Get a free account today! It offers an easy to use interface and comes with a preset of useful band combinations which make it easy to get started. Additionally, all images created with the EO Browser or the Sentinel Hub Playground can freely be used in media publications (CC BY 4.0 licensed), so there is no hassle about publication rights or time lost to get usage permission. More information on the Sentinel Hub Journalism pages, also offering some more examples of satellite image use in articles. You should also check out the Sentinel Hub Education pages to get some more information about remote sensing, especially when you are just starting using satellite images. There is also an opportunity for the GIS community to educate a broader audience, consisting of civil society organisations working on land rights, natural resources, environment, human rights, disarmament and conflicts to utilize the data available. I wouldn’t just limit it to civil society organisations but keep it at “a broader audience”, consisting of the general public and especially journalists. While the access to satellite images and data got a lot easier during the last years, there is a bit of a lack of good information for beginners on how to get started and how to interpret satellite images. Information can be found in snippets of different sizes all over the web, but it would be nice to see more resources in one place. Initiatives such as the Sentinel Hub Education pages are a good start, but there is still some work to do. 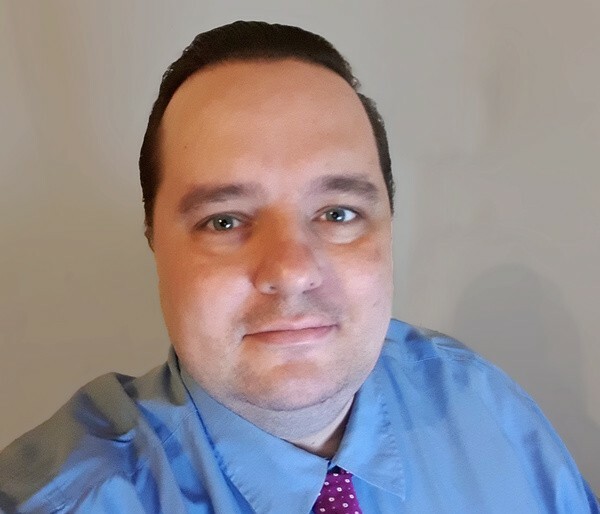 Pierre Markuse is a freelance remote sensing expert and blogger with a special interest in optical remote sensing, his images being used by numerous media outlets. How to make satellite images more approachable to the general public, communicating scientific backgrounds, and the usage of satellite images in journalism are additional fields of interest. You can read more of his work on his personal blog here or take a look at his satellite images here on Flickr.